Genre... oh genre. I read so much out there on the blogs and message boards about the role, ghettoization, problems, glories, and general existence of genre in literature. So what is genre? And what's the fuss all about? Basically, there are some general groupings acknowledged by the book industry that are meant to help make "discovery" easier for readers, which is a whole sticky topic in and of itself. If you know that you like Paranormal Romance, it's helpful that all the Paranormal Romances are grouped together in an online store or your local Barnes & Noble, or so the logic goes. 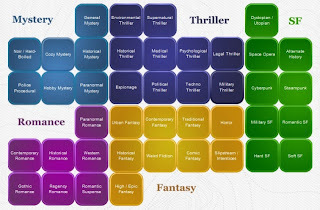 However, a lot of fans of books that fall into a genre, rather than general fiction, can get very touchy about the connotations that the term "genre" carries with it. For me, genre is only a comment on quality if a book isn't able to transcend that genre for general readers. Meaning that someone like Margaret Atwood produces books that are both science fiction and literature. Never Let Me Go (how good was that one?! Loved it) was both science fiction and literature. "Literature" to me is simply saying that something has a higher level of mechanical competence and thematic sophistication- it has some kind of "X factor" that makes it more than it's plot or characters. However, if someone says something is "just fantasy" or "just mystery," I take that to mean that it's a book that doesn't transcend the genre's tropes or conventions and that if you don't generally find those types of stories entertaining, it's probably not for you. I'd say that John Grisham is "just legal thriller" - but I like legal thrillers, so I'm game (an example of something that is legal thriller and literature is To Kill a Mockingbird). Whereas I don't generally like "just chick lit," so I'm less likely to read a book that's being sold as that (an example of something that is chick lit and literature is Pride and Prejudice). People get defensive about things being "just " because they don't want to be perceived as liking something with less quality. But so what? It's fine to read things that aren't going to stand the test of time for the general public. I can't get enough of "The Real Housewives," but I'm not going to try to argue it should get an Emmy. I like "just genre" and literature, and there's nothing wrong with either- they're just helpful for people to find what they are likely to enjoy. I'll stick with this... Genre is something, to me, that alerts me to the fact that the writing itself might not be so great and/or that it may not have broad appeal. To me, that's helpful. That's something that I want to know about a book before I make the commitment to engage with it... in many cases, I'm okay with the fact that the book might be playing to certain repetitive patterns or that it might not sing with its language. But I do want to know that up front, and I'm okay that the genre terms are used to convey that information to me. And as I said, if someone combines genre conventions with a higher level of writing, I really love that. I really love Mystery + Literature, or Fantasy + Literature, or even Western + Literature. This week, I'm reviewing a couple of books that are pure genre and literature + genre. The results of this experiment are mixed, but telling, I think. Do you like genre books? Do you find genre labels helpful or stigmatizing (or both, like me)?